Would you like a copy of the QuantConnect source code; so you can code, backtest and trade locally from your computer? You could design and debug strategies from your laptop in Visual Studio, using a local data-source, and then when you’re ready simply deploy it to the cloud to backtest on our entire tick-level data library? And by working locally you can guarantee your proprietary data is safe, and maintain complete strategy privacy. 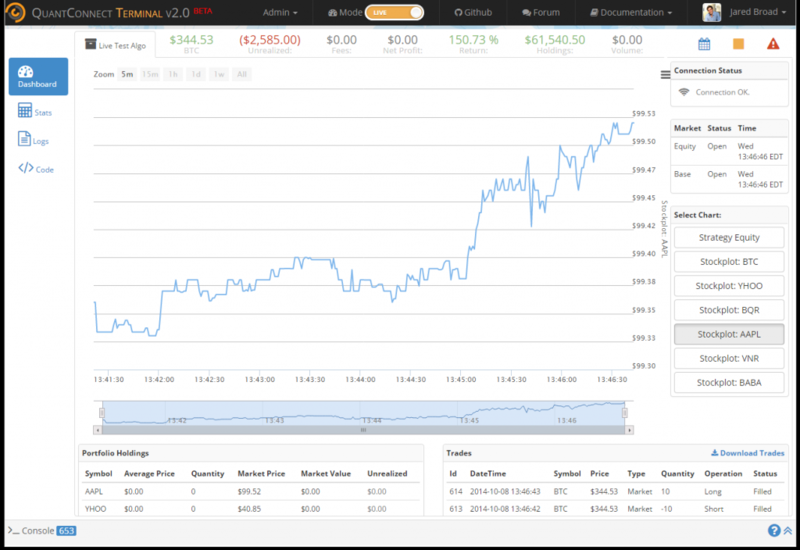 We think this would be a perfect algorithmic trading platform and we want to make it happen! 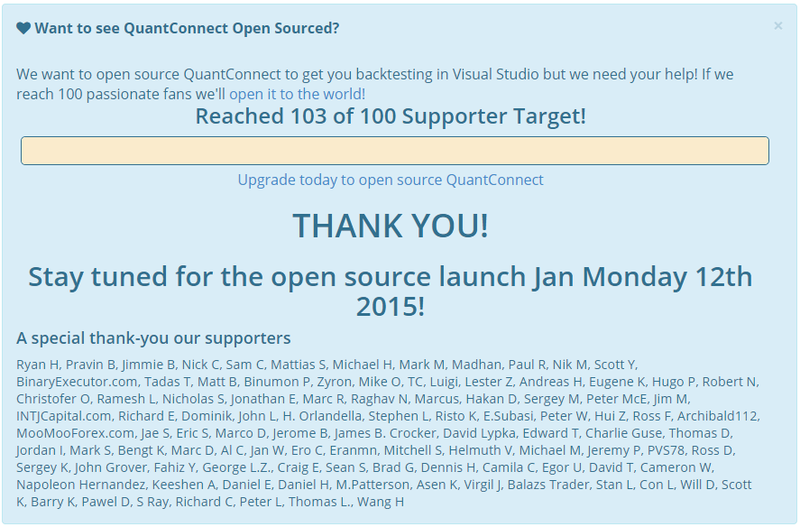 We’re launching a quant-crowd-funding campaign! When we reach 100 hobbyist subscriptions we’ve committed to open sourcing the QuantConnect LEAN Algorithmic Trading Engine! We want 100 fans, believers, passionate quants who will form the core pioneers of the QuantConnect platform. With your help we will lead the future of algorithmic trading. Pioneers will be forever remembered on our supporters page, in addition to receiving a dedicated live trading server for running your strategies! (1 CPU / 512MB RAM / 20GB HD / 1TB Data Transfer). We’re just scraping the surface of what is possible with QuantConnect! We’re excited to be adding powerful new features, and making the engine faster and more robust each day. For the first 100 Pioneers you’ll get a lifetime, $10/mo hobbyist subscription. Once you upgrade we’ll apply the discount but it is for a limit of the first 100 users! Massively parallel cloud backtesting, optimize parameters to reduce algorithm sensitivity in minutes across our cloud. Run monte carlo simulations and view strategy sensitivity curves. We’re starting futures and options asset support, along with a tool to easily import external data to design robust profitable algorithms! We’re working on an object tree inspector and true C# auto-complete, combined with project folders so you can easily build complex strategies! Fundamental data powered by Morning Star so you can select a universe of companies by index, earnings and other key fundamentals! Upgrade today and help us build the best algorithmic trading platform in the world. Sustainable, independent and community driven.